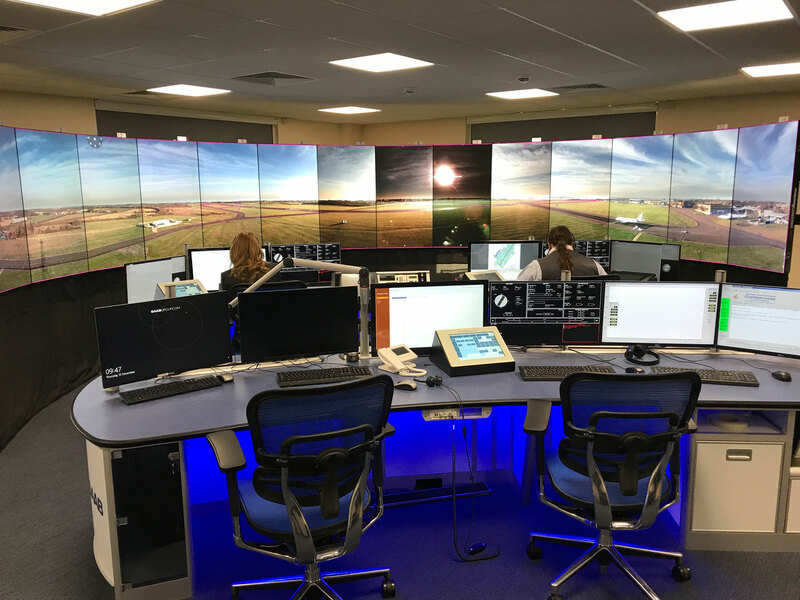 Saab Digital Air Traffic Solutions installed Cranfield’s new tower in a jointly funded partnership with the university. Implementation has been swift: the contract was signed in October 2017, with construction beginning in March. Completion of the installation permitted air traffic control officers (ATCOs) to “shadow” the operations of the existing traditional visual tower for six weeks while Saab technicians fine-tuned the system. The “opening” of the control center was made possible under a temporary approval to gain live experience with limited traffic. Now the stakeholders are embarking on a phase of working closely with the UK CAA (Civil Aviation Authority) to clear the system for unrestricted use. Cranfield hopes to complete the transition in around six months, at which time its aging visual tower can be closed. The system installed at Cranfield comprises two elements: a sensor “tower” and the control center. The former mounts 14 cameras that are arranged to provide 360-degree surveillance of the entire airfield and surrounding airspace. The cameras are fitted with compressed air blowers to clean moisture from the lenses. The tower also has cameras that can be panned, zoomed (up to 30 times) and elevated to the vertical to provide controllers with the ability to examine targets of interest in detail, effectively replacing the binoculars in a traditional tower. The 360-degree imagery from the cameras is displayed in real time on a 225-degree arc of screens around the operator consoles. This provides the ATCOs with a measure of directional awareness, but without the need to turn all the way around to see behind. Each controller can operate the pan/zoom function, imagery from which appears in a picture-in-picture box on the main screens. Security and safety are of paramount concern, and the system features high levels of redundancy, with digital data handled through two independent networks and powered by three independent sources. There is a spare TV screen available in the control center should there be any issues with the “live” screens. All imagery is automatically recorded, along with ATC voice communications, making it readily available for investigation in the case of an incident. The system automatically handles varying light conditions, with four preset settings that cater to seasonal differences in the environment, such as sun elevation and vegetation color. Manual control permits the controllers to adjust for specific conditions; for instance, an individual screen can be dimmed to reduce the effects of sun glare in a particular sector. There is also a geo-referenced graphic overlay function that can present various data to the ATCOs that is not possible with a traditional tower, such as the exact location of taxiway/runway boundaries. This can be very useful in poor visibility or snowy conditions. Cranfield’s ATCOs, who are employed directly by the university, have found the transition easier than expected, and have adapted quickly to the new working environment, which has been designed with input from controllers at every stage. For Saab—a pioneer in digital towers—the Cranfield installation represents a good investment to showcase the company’s technology. The company began digital tower operations in Sweden in 2015 as part of a joint venture with air navigation services provider LFV. The first installation was a control center at Sundsvall airport that also controls operations at Örnsköldsvik remotely. In this case, the center has two separate “cabs” for the two airfields, but Saab could configure one screen array to handle two airfields on an active-inactive sequential basis. While one airfield is active the screen array shows that airfield, with possibly a separate small display to permit secondary monitoring of the inactive field. Saab is now installing digital systems at Linköping and at the new-build Scandinavian Mountains Airport at Sälen-Trysil. The company is also providing digital systems to the Irish CAA, and at London City Airport. As well as replicating the view from a traditional tower, the Saab system allows advanced augmented reality functions, some of which will be researched in the Cranfield center. An automatic tracking function can be added to the zoom camera, allowing it to alert ATCOs to drones and other potential hazards, while the graphic overlay function permits the display of numerous other data, such as radar and secondary surveillance information as provided by wide area multilateration and other technologies. The control center can also be expanded to monitor and control the operations of ground vehicles, especially those that operate autonomously. Research into these fields, and especially into the integration of manned and unmanned systems, is the primary reason that Cranfield has adopted the digital tower as part of its Cranfield Global Research Airport vision. The University—which grew out of the College of Aeronautics that was founded in 1946 as a post-graduate research center, and which is situated at the heart of the Oxford-Cambridge “innovation arc”—is globally unique in owning and operating its own airfield and research/flying classroom aircraft (two Jetstream 31s, one of which is shortly to be replaced by a Saab 340, plus a British Airways-donated Boeing 737 ground trainer). It has the ability to completely shut down the airfield to conduct trials of new innovations on behalf of both industry and academia. The new digital tower is an integral part of the future activities of the University’s DARTeC (Digital Aviation Research and Technology Centre), a venture part-funded by industry that will open in 2020. DARTeC is tasked with exploring areas such as drone and unmanned vehicle integration, secure data communications, increased aircraft reliability and availability through self-sensing and self-aware technologies, and to the harnessing of digital technologies to enhance airport efficiencies.